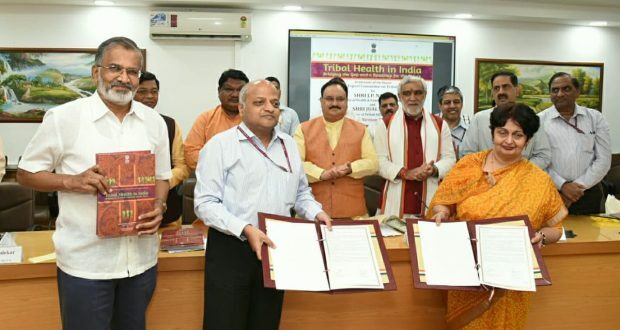 Newdelhi:10/8/18;A Memorandum of Understanding (MoU) has been signed between Ministry of Health & Family Welfare (MoHFW) and Ministry of Tribal Affairs (MoTA), Government of India for cooperation between the two Ministries for sensitizing the principals and training to teachers each of all functional EMRSs, Ashram Schools and other Schools supported by MoTA in the country using the existing infrastructure of MoTA in the states. The MoU covers various activities including extending all aspects of the School Health Program viz., providing weekly Iron and Folic Acid Supplementation, biannual de-worming, basic first aid and health promotion activities through teachers designated as Health and Wellness Ambassadors at the school level in all functional EMRSs, Ashram Schools and other Schools supported by MoTA in the states. Ensuring quality training of Master Trainer and District Level Trainers and periodically reviewing the status of implementation as per the guidelines of School Health Programme. Issuing the required directives to the States where EMRSs, Ashram Schools and other Schools supported by MoTA are functional to extend all assistance to MoHFW for sensitization of principals and training of Teachers, allocating and disbursing the required funds to the States for sensitization of principals and training of Teachers and organizing School Health Programme activities within its existing schemes and issuing necessary instructions to the States with EMRSs, Ashram Schools and other schools supporting by MoTA for reporting of activities as per the formats given in the School Health Programme with the indicated periodicity to MoHFW are some of the other activities covered under the MoU.